Hello gentlemen. This is my 11 month post op update from my second procedure with Dr. Armani, which I underwent on December 9th, 2009. First, I will give you my history. In 2005, I underwent a 1,700 strip procedure with another physician which didn’t turn out the way I expected. On December 7th, 2007 I underwent 4,000 FUE’s with Dr. Armani, which was my first procedure. The results were nothing short of great. 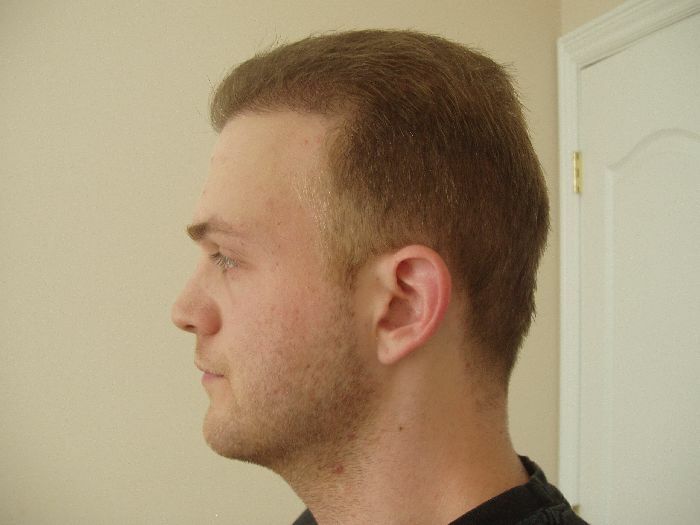 On December 9th, 2009 I decided to undergo a 2nd procedure which focused on increasing hairline density a bit, and placing some grafts in zones 2, 3, and a bit in 4. In my latest consultation with Dr. Armani he said that i’ve only experienced 70% growth thus far and that i still have 30% left in the upcoming 7 months or so, which excites me. However, the best news that I’ve received from Dr. Armani is that he is able to extract 4000 more FUE’s should I need it in the future, which is why I posted a photo of my donor area for all of you to see. I plan on having another procedur in the upcoming year which will focus on adding more density to any areas which need it, but a little more emphasis on zone 4. I usually wear my hair quite a bit longer, but the photos I posted here were takin in bright lighting along with a flash camera. I also got a very short haircut (6 guard on top & 1 guard on the side) so that all of you can see the details of how my results are progressing. Please feel free to share your opinions as well as ask me any questions you might have. Best to all of you. Hey marco ive been wanting to ask you about caspase because i lost my hair after taking Guggul / Guggulsterone for my acne and now I found out that it is also used to treat cancer. 4 years later after stopping, I still am losing a lot of hair all over my body. It activates/ upregulates caspase. Hi Paul, I really do not want to hijack the thread. 1: Caspase inhibitors must be cell permeable and I do not know of any therapeutic inhibitors. There are several research small molecules. Also there are many caspases and some activate other caspases so it is not simple. I would assume that caspase inhibition risks immune cell proliferation and lack of differentiation which is dangerous. 3: Surely the use of a steroid would not be effective four years after. is something else going on? 4: Thanks for the complement. My blog pics were three years ago and thing are not what they were. I really need an HT! » losing a lot of hair all over my body. It activates/ upregulates caspase. Hi, Marco, I apologize to Mr. original poster, please ignore my posts, I am new here. BTW, congratulations on your HT! Marco, my hair loss is diffused and is all over my body, up until recently when i began losing on the sides of my hairline forming a horseshoe shape. It’s like an effect of chemotherapy drug that is happening to me, only that i am losing hair still, after stopping for more than 2 years ago from taking Guggulsterone / guggul (i didn’t know that it was also used for cancer). I don’t know what could work for my case doctors don’t even know either. It’s like the same effect that some accutane users have, continuous thinning hair - which has to do with caspase activation / upregulation. » Hi Paul, I really do not want to hijack the thread. » proliferation and lack of differentiation which is dangerous. » something else going on? » are not what they were. I really need an HT! Paul, could you start another thread to deal with this as it would not be polite to do this here since the thread is about an armani case. Also try to get some pics of yourself. I’ll be frank; your results are good, and you’ve posted some of the best quality Armani pics I’ve seen to data, BUT – and I’m sorry to say this – it looks like you’re going to need allot more than 4000 grafts to fill in those thin spots, your hairline needs a tad more thickening too, and I doubt you have enough grafts available to accomplish those goals. Your rear donor area’s taxed (especially when we consider the strip scar that needs a certain amount of hair to stay disguised), and I’m not sure Armani can extract 4000 grafts from your sides). » ask me any questions you might have. Best to all of you. If I were him I would not bother filling in the thin spots, just leave it like that, it looks natural, there’s no point going after the perfect head of hair or you are asking for trouble. Your rear donor area’s taxed (especially when we consider the strip scar that needs a certain amount of hair to stay disguised), and I’m not sure Armani can extract 4000 grafts from your sides). Dr. Armani saw Eurohair last month himself for an in person follow up and personally evaluated his donor region. He evaluated that we can safely extract another 3,000 - 4,000 grafts from his donor area and the strip scar will not be noticeable from his prior procedure. Similar to what Eurohair stated in his post. I am not sure how you came to the conclusion that this patient’s donor area is “taxed” after seeing one photo online of the patient’s donor and not being a hair transplant surgeon yourself. However, I am sure your examination of the patient’s photo was not as meticulous as the follow up Euro had with Dr. Armani. Please don’t try to sell him another hair transplant,he doesn’t need that, whoever said his hair is perfect now is right on, he doesn’t need any more grafts, just some propecia and rogaine may go a long way for him. Eurohair, how many grafts have you done in total since the very beginning, including the 1700 grafts from your first procedure? Is 6436 the grand total counting all procedures from all doctors or is 6436 the number of grafts you had from your 2nd procedure with Armani? NUMBER ONE) Dr Armani’s part doctor, part business man (just like any other doc practicing in the cosmetic field), so I hope you’ll forgive me for doubting anyone whose partially motivated by financial gains. NUMBER TWO) Do you remember this thread? "8000 grafts was thrown around here as the average, safe donor supply (via FUE). I can’t find the exact post at the moment (the search feature’s acting-up), and there’s a good chance the thread was deleted (as was customary here back in the day). I do remember cal flipped his lid when the number was mentioned (you tend to remember the times when the calmest person on hairsite loses their nerve). ~ from the internet "
Based on those numbers, I doubt this patient has more than 1500grafts available. posted by Pats205, 18.11.2010, 14:22Dr. Armani saw Eurohair last month himself for an in person follow up and personally evaluated his donor region. not sure Armani can extract 4000 grafts from your sides). Silly question but, why wouldn’t this patient style their hair with a more forward oriented style? I would think that would reduce the “see through” effect quite a bit. When it’s pushed back and straight up you can see through it back to nearly the crown. I don’t know a whole lot about transplants. Do the patient and doctor have to decide before hand how the patient wants to style their hair and then the doctor implants the follicles in an orientation that would permit that type of look? Does the follicle orientation exclude certain looks e.g. 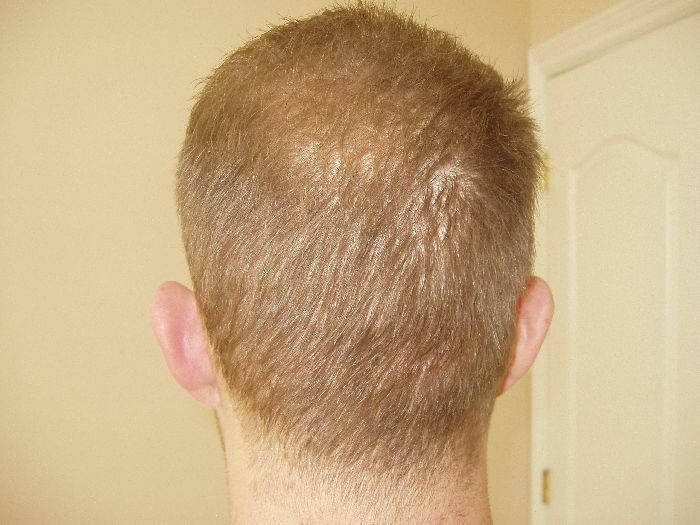 can this patient comb forward or would it not work due to follicle orientation? First and foremost i’d like to thank all those, including rev who are complimentary of my results. Regarding the gentlemen’s question, I’ve never tried combing my hair forward, but it is an interesting suggestion. The other thing to keep in mind gentlemen is that this hairstyle that i have in these photos is the shortest i’ve worn my hair. a 6 on top and a 1 on the sides. I did this intentionally so that everyone could see that even when my hair is this short i have very good coverage. When my hair is longer you can’t see any thining. In addition to this, like Pats had said, I had a personal consultation with Dr. Armani and he told me that he could easily pull 3,000 to 4,000 more FUE grafts if necessary. Look up a gentleman named ernst who was completely bald and had over 10,000 grafts to restore his hair. Alltogether I’ve had around 8,100 grafts which includes my first strip procedure of 1,700 grafts which didn’t give me the results I had hoped for. I appreciate all the feedback gentleman. » not sure Armani can extract 4000 grafts from your sides). » personally evaluated his donor region. » procedure. Similar to what Eurohair stated in his post. » Euro had with Dr. Armani. Are you taking into account that his donor hair will most likely thin out badly in the coming years? He seems to exhibit the classic traits of donor hair which is DHT prone especially when he gets to his lower 40’s. I know because the same thing happened to me… a decision I will regret for the rest of my life. People need to be aware that not every ones donor hair is “safe”. Honestly guys, I have had over 8,000 grafts and I can not tell at all that I have ever had a procedure. My donor still feels very thick and even when buzzed down to a number 1 guard it is not noticeable that I had any work done. When I grow it out a little longer it is even thicker. I am very happy with it. Hanging, Rev - You guys can say what you want about what can and cannot be done with a patients donor, limitations etc… but you are not doctors. I have been through it and I am proof that you can get this many grafts. I have no doubt Dr. Armani can extract another 3,000 grafts, we spoke about it at great lengths when he personally evaluated me. I have already had 8,100 grafts transplanted and my donor looks great. » have been through it and I am proof that you can get this many grafts. » had 8,100 grafts transplanted and my donor looks great. Look how many grafts you alreeady used up, you say 8000? you say they can easily get 3000 more, lets say 2500 whatever. » easily get 3000 more, lets say 2500 whatever. Front load his scalp?? He has had all 4 zones transplanted already. The hairline the middle and the crown… His last procedure was for the crown. He is at approx 70% growth in the crown now. Not to mention his next procedure will be to thicken up zone 3 and 4. So say he has another procedure for 2,500 grafts to thicken up zones 3 and 4, this will put him at 10,000 grafts with coverage in all 4 zones at medium to high density. The hairline, vertex and crown will have all been transplanted. Full coverage. 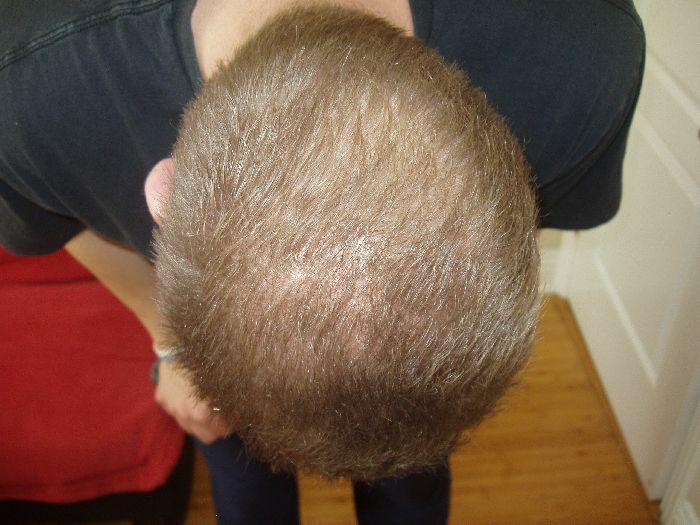 Do you use Propecia or Minoxidil? yes, i use minoxidil. 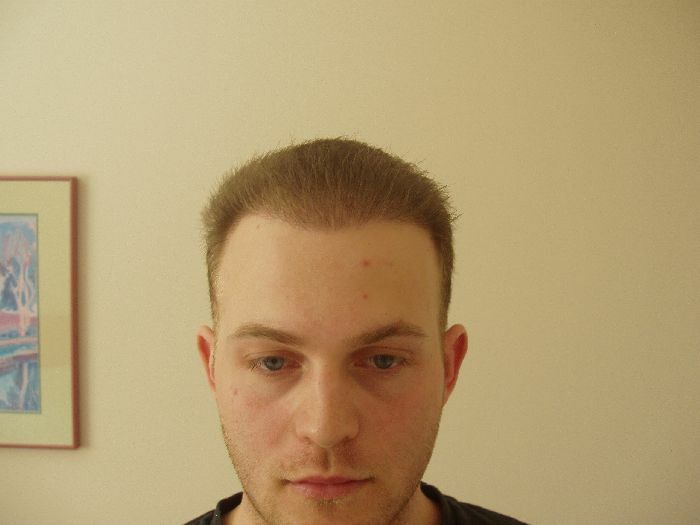 I’m not a good responder to propecia.